REI engineers, designs, manufactures and supports a series of Multiple Shaft Industrial Shredders and Grinders for the most demanding material size reduction applications. REI engineers and designs and supports a series of Multiple Shaft Industrial Shredder and Grinder systems for the most demanding material size reduction applications. 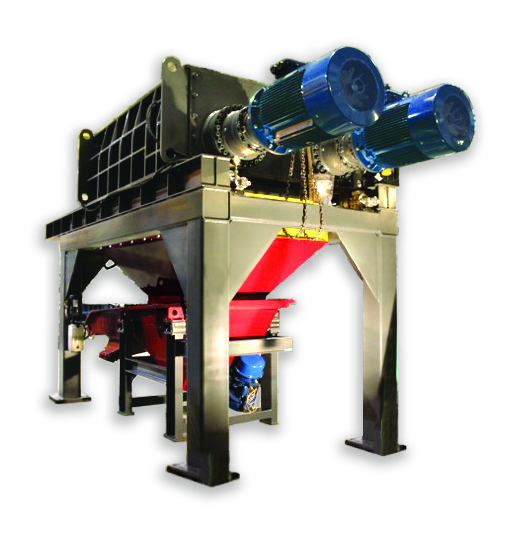 The Quad Shear Shredder handles your waste with primary & secondary shredding capabilities. Utilizing a unique 4-shaft design, the Quad Shear delivers a uniform output piece size. The Quad-Shear has the appetite to handle your waste for primary and secondary shredding. Utilizing the unique four-shaft design, the Quad-Shear duplicates products produced from larger costlier systems. Material is kept in the cutting area for high volume production, internally recycling particles over various pitched screens to produce finish piece sizing. It operates at slow speed with minimum noise (under 70-76 dB), dust and energy requirements with automatic anti-jamming action.